BGen Carpentier began his career with the Canadian Forces in August 1986, following his Basic Air Weapons Control course in North Bay, Ontario. Over the years he was posted on many different assignments and served in numerous roles. From the 12th Missile Warning Squadron in the late 80s to the Phased Array Ballistic Missile Early Warning System, 1st Space Wing Headquarters Peterson AFB, National Defense Headquarters in 1993. Then on AWACS in Geilenkirchen, Germany where he served as a Weapons Director, Fighter Allocator, and Mission Crew Commander. In 1999, following his promotion to Major, he was selected as the NATO Exchange Officer representing the NATO Airborne Early Warning Force in France with the 36e Escadron. In July 2002 BGen Carpentier returned to North America and was posted to Tinker AFB, Oklahoma to fly on the USAF E3-B and C models. In addition to operational deployments in support of operations in Afghanistan and Iraq, he served as the Wing Deputy Chief of Standards and Evaluations. In 2005, BGen Carpentier assumed command of 12 Radar Squadron and then served as the NORAD Director of Inspections, Peterson AFB, Colorado. In July 2010, BGen Carpentier was again selected for Command, this time of the Canadian AWACS Detachment at Tinker AFB. He was then chosen as the Deputy Commander Alaskan NORAD Region. Following an extremely busy operational tour in Alaska, he was brought back to NORAD HQ as the J8 Deputy in August 2015 where he worked Requirements, Analysis, Resources and Science and Technology. In April 2018 BGen Carpentier was promoted to his current rank and appointed as Commander Joint Task Force North (JTFN). Over his five AWACS tours, BGen Carpentier has amassed over 3480 flying hours and 186 combat and combat support missions. Here is the full interview with BGen Carpentier. Since you have recently taken command of the Joint Task Force (North), what are some of the main areas you will be looking to focus on? While I am new to Joint Task Force (North) (JTFN), I was the Deputy Commander of the Alaskan NORAD Region from 2013 – 2015 and came here from NORAD HQ where I served as the Deputy J8, which dealt with resources, requirements, capability advocacy, analysis and science & technology (S&T) to include the Arctic problem set. JTFN’s Area of Responsibility (AOR) is massive, as it spans over three territories. It encompasses 75 per cent of the country’s national coastline and 40 per cent of its total land mass. Yet these numbers fail to properly illustrate the true vastness of our AOR. Overlaying our AOR over the continental United States, I feel, is a better depiction for most North Americans to begin to understand the tyranny of time and distance my team deals with daily. The Arctic is constantly changing, which means we must adapt and be ready to act rapidly when called upon. One of my priorities is to make sure that my staff has the right tools to respond to various scenarios that could occur in the North. The climate of the Canadian Arctic is extreme and harsh in the winter. Careful preparation and measured responses are key to success in conducting northern operations, as is working in collaboration with a myriad of other government, international and non-government partners. This means that both Canadian Armed Forces (CAF) and DND civilian employees who work at JTFN must have the right training, skills and knowledge to operate within the complex environment of a whole-of-government model. This is one of the reasons why we conduct interagency operations and activities such as hosting the Arctic Security Working Group. Also, JTFN facilitates the deployment of CAF assets and personnel to Canada’s North as it is a key component of northern defence. Through these deployments during Operation NANOOK, the CAF can enhance its employment ability, as well as its presence in the Arctic region. Other than 20 hours of beautiful summer daylight in Yellowknife, I sleep well knowing that the 1800 Rangers of the 1st Canadian Ranger Patrol Group (1 CRPG), my staff and I are ready and can access the resources required through the Canadian Joint Operations Command (CJOC) to deal with any eventuality. We are here in the North to do our job: protecting Canadians. We constantly review our procedures to plan, coordinate, and conduct operations. We operate in the Arctic and preparedness is essential. The staff at Joint Task Force (North) are dedicated to their mission, and I am extremely grateful for their hard work and to be part of such a devoted team of professionals. What role does Canada’s new defence policy, Strong, Secure, Engaged, play in your mission for the Canadian Arctic or would play in the near future? The Canadian military has operated in the North since the days of the Klondike Gold Rush during the late 19th century and the Canadian Arctic has always demanded our resiliency to makes us strong at home. Learning from our past experience, the CAF became one of the major partners in the Arctic and a key capability building asset within the federal family through enhanced presence, interoperability and readiness. JTFN facilitates, supports and coordinates many northern activities with other organizations to ensure that Canada is protected and Canadians are safe. 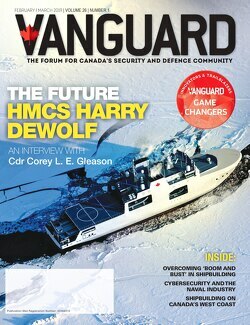 Canada’s defence policy, Strong, Secure, Engaged,(SSE) has many goals laid out for the Arctic. One key point that JTFN focuses on is maintaining a good relationship with our northern partners. Sharing knowledge across areas of expertise has allowed us to effectively support Arctic programs, monitor our internal waterways, and conduct northern operations. Indigenous communities are at the heart of Canada’s North. As such, we work to deepen our extensive relationships with these communities, engaging local populations as part of routine operations and exercises. Additionally, Canada’s contributions to enhancing regional Arctic security form a core tenant of the Canada-United States defence relationship. While operating in Canada’s North, we often work in close partnership with other federal, territorial, and local governments and departments. As such, we leverage our capabilities to support whole-of-government initiatives, helping them deliver their mandates, in turn supporting Government of Canada priorities in the Arctic region. The North has little infrastructure and is a unique, vast, harsh, sparsely populated, and expensive place to operate. When we deploy, we coordinate with partners to maximize the effectiveness and impact of our operations in order to ensure the defence, security and safety of Canadians in support of the Canadian Government. For example, Operation NEVUS is a yearly operation to maintain and upgrade the High Arctic Data Communication System (HADCS). The system provides communications between Ottawa and the most northerly inhabited place in the world, Canadian Forces Station Alert. Recently, capitalizing on the presence of our personnel and assets, we conducted environmental reconnaissance on known legacy fuel cache sites on Ellesmere Island, allowing us to dispose of some 2,000 empty fuel barrels. During this operation, we effectively combined maintenance of a communication system while contributing to environmental stewardship. JTFN facilitates the development of mobility equipment for CAF members deployed in the Arctic whenever possible. Joint Task Force (North) recognizes that climate change, combined with advances in technology, is leading to an increasingly accessible Arctic. It is therefore of utmost importance to modernize our Arctic equipment such as our all-terrain vehicles, snowmobiles and medium over-snow vehicles. Development or procurement of Arctic equipment does not directly fall under JTFN, but we can facilitate it. For example, Defense Research and Development Canada (DRDC) technicians, researchers, and scientists often deploy with CAF members to some of the most austere locations in the world to test out new operational concepts and equipment. Security is paramount in every operation and area. What do you perceive to be some of the threats to the security of the Canadian Arctic? From a defence perspective, the North is a vast area of approach to our continent which must be defended. To this end, through NORAD, a bi-national Analysis of Alternatives (AoA) has been launched to examine the technologies that will form the basis of the next generation of systems to surveil, defend and control this avenue of approach from evolving threats. Joint Task Force (North), through CJOC, supports Tri Command (NORAD, CJOC, USNORTHCOM) initiatives by enabling S&T efforts in the North that will contribute to future systems. JTFN also collaborates with different organizations and Indigenous governments in order to achieve our mandate of defence and security in the North. Communications and logistical support is challenging in the Arctic due to lack of redundancy and environmental considerations. To be strong at home, we ensure the North is defended and work with our Arctic partners to address the security and safety in this austere environment. This is why we are in the North; to provide the mechanism to plan and coordinate operations along with our northern partners and stakeholders. How do you face the communications challenges of the Arctic? We are very excited about the new capabilities that will be delivered under SSE, but for now, despite the limited communication infrastructure in the North, we have addressed our communication challenges in many ways. Firstly, we use the existing communication infrastructure, as it is still the most cost-efficient way to send messages across three territories as long as we do not overwhelm the communities’ service capacity. Secondly, we augment existing limited communication infrastructure in northern communities with our own military satellite communication systems such as Broadband Global Area Network (BGAN), Ground Antenna Transmit and Receive (GATR), and other satellite internet services that provide ultra-portable and reliable connections across the three territories. Finally, we have our own military assets such as High Frequency radios that can be deployed as an alternate means of communication to satellite communications. Due to the Arctic’s flat landscape, these radio waves can travel far and can be an effective way to communicate. Effective communications being crucial to successful operations, JTFN always plans backup communication systems for any operation. What will the NANOOK series of exercises focus on in the coming year? Changes in the Arctic are constant and have been for decades. Waterways are more accessible, tourism has increased, and industries are looking for new business opportunities. This means that the CAF needs to adapt to new demands and challenges by improving the way we operate in Arctic conditions. Through enhanced collaboration with federal departments and agencies, Indigenous and territorial governments, and international and northern partners, JTFN helps develop scenarios that stress, yet support, partner objectives to tackle northern defence, security and safety concerns. Operation NANOOK – the CAF signature operation which delivers Arctic training, develops partnerships, and improves readiness of its participants – will reinforce the CAF as a key organization and expert in Arctic defence, security and safety matters not only in Canada’s North, but in the circumpolar strategic context. Operation NANOOK is no longer a month long operation during late-summer. It is now a yearlong operation with five deployments to ensure the best possible benefit for everyone participating. Operation NANOOK provides more persistent presence and surveillance in the North while keeping northern partners connected. Would you support the deployment of SAR assets in your area of responsibility? Search and Rescue (SAR) is a shared responsibility across Canada. Therefore, I support the deployment of SAR assets to the North. As a representative of the CAF in the Arctic region, I am proactive in SAR missions regardless of whose responsibility it is to respond by anticipating needs and supporting request for resources. There are various agencies and departments responsible for different aspects of search and rescue. JTFN supports SAR by facilitating Ground Search and Rescue (GSAR) when a request is received through a territory. JTFN’s Joint Operations Centre monitors all SAR events within our area of responsibility and assesses the need for a rapid deployment of GSAR personnel. If GSAR is necessary, I can authorize activation of the 1st Canadian Ranger Patrol Group to help the lead agency in the nearby community where the SAR event is occurring. The Arctic Security Working Group meets biannually to strengthen relationships between governments and communities in addressing northern issues. What are some of the benefits of collaborating with the Arctic Security Working Group, and what impact is this having in your role as Commander of the JTFN? The Arctic Security Working Group (ASWG) is a platform that is co-chaired by Joint Task Force (North) and the three territorial governments. This meeting brings together over 20 federal departments and agencies, territorial governments, international participation from Alaska and Greenland, as well as Arctic academics and other experts to talk about defence, security and safety in the region. The purpose of ASWG is to enhance cooperation and collaboration, to leverage resources, and to enhance interoperability. This is the forum where many other departments and levels of government can come together to inform each other about their capabilities and requirements. This sharing of knowledge and resources mirrors northern culture and supports efforts to ensure the security and safety of the North.